Crop straw return into arable land is a common method of disposing of excess straw in China and can improve soil dissolved organic matter (DOM) that is known to modify soil zinc (Zn) extractability and mobility. We conducted a soil box (internal dimensions, 160 × 140 × 80 mm3) experiment to evaluate the response of Zn extractability and transfer by diffusion to DOM after maize straw amendment (St, 0 and 15 g kg−1) in calcareous soil treated with ZnSO4·7H2O (Zn, 0 and 20 mg kg−1). Soil treated with St0Zn0 (control), St15Zn0, St0Zn20, or St15Zn20 was isolated in the 10-mm center of the box, and untreated soil was placed in compartments at either side. Results revealed that addition of St0Zn20 or St15Zn20 increased the concentration of Zn extracted with diethylenetriaminepentaacetic acid (DTPA-extractable Zn) in the central layer compared with control or addition of St15Zn0. 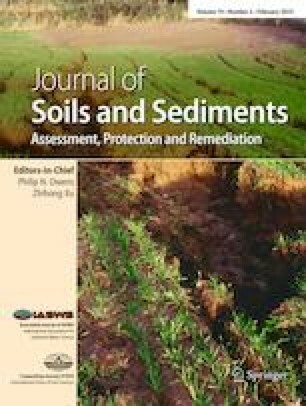 Over the course of 45 days, transfer of DTPA-extractable Zn into the adjacent untreated soil was detected at 15–20 mm in soil with St15Zn20 but at 10–15 mm with St0Zn20 and only 0–5 mm with St15Zn0. Additionally, a higher amount of DTPA-extractable Zn transfer into the adjacent untreated soil also occurred in St15Zn20. This increased DTPA-extractable Zn transfer may be associated with the formation of Zn-fulvic acid complexes with the provision of DOM derived from straw. Soluble Zn combined with straw return may be a promising strategy for improving both Zn mobility and extractability in calcareous soil. The online version of this article ( https://doi.org/10.1007/s11368-018-2060-x) contains supplementary material, which is available to authorized users. This work was financed by the National Natural Sciences Foundation of China (41371288, 31662233) and the National Key Technologies R&D Programs (2012BAD14B11) of China during the 12th Five-Year Plan period.